August 'Auggie' Pullman is a ten year old boy entering the education system for the first time, having been home schooled for the first few years of his life. It's tough starting any new school but August has other reasons to be anxious about starting school; Auggie looks different to the majority of society, having been born with complications resulting in a deformed face. Prior to reading Wonder I wasn't aware that the book isn't just told from Auggie's perspective, as I had assumed. In fact, the story is told by a number of different characters over the course of a school year, as well as Auggie himself. Making an appearance as narrator is August's sister, Via, two of August's friends, Jack and Summer, Via's boyfriend, Justin, and also a friend of Via's but more of the Pullman family, Miranda - I hope I didn't miss anyone there. When I discovered this is how the story was to unfold, flipping between narrators, I did wonder how seamless and how easy it would be to keep up with the plot, but the chosen method worked really well with the story and each character picked up where the other left off, even slightly before in some instances, meaning you get to see some situations from multiple eyes. Wonder is driven by both plot and character. I've outlined the plot in my opening paragraph and I'm trying to not go in to it much more than that as I think reading this book without knowing a timeline of sorts makes for a better reading experience, but I love the message behind Wonder - kindness. I think Wonder should be a book assigned to school reading because of the message it successfully portrays to an audience of both young and old. In the way of characters, I dare anyone to come away from Wonder without having wanted to envelope August in a hug at least once during the book. Honestly, he is the sweetest boy, but so clued up and full of humour. The multiple narration means we get a good look at Auggie, from his own view point as well as from those around him, and you can see why they love him and want to protect him in the way that they do. Coming from a family with a sibling who has been disabled from birth and who has also always looked different from society's norms, you could say Wonder tugged at me a little more than some, but Wonder is a heart wrenching story that could easily reduce anyone to tears. I've never really been one to cry at books, but I was pretty darn close by time I finished Wonder. 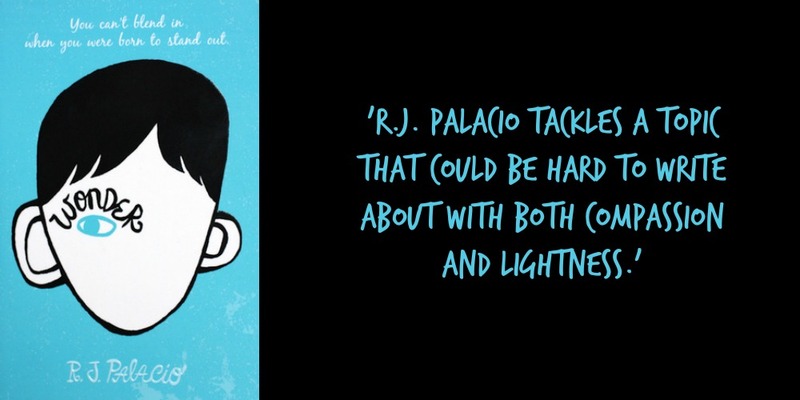 R.J. Palacio tackles a topic that could be hard to write about with both compassion and lightness. If you're looking for a book that will take you on a rollercoaster of emotion but with an uplifting ending, Wonder is the book for you. I've heard nothing but good things about this one and I hope to read it soon and pass it on to my son when he gets a little older. By the way, I love your picture. What a cool way to show off your book! It's hard to believe when you hear pretty much wholly positive feedback on a book, and I think that's why I put off reading Wonder for so long. Ah, that's a lovely idea to pass it on to your son when he is a little older. I'm sure you'll both love it! Thank you, Lindsey. I'm trying work on book photography a little more but I find it hard because we have terrible lighting in our house! I agree - this is a book everyone should read. I loved the different viewpoints. I didn't expect that either, but it made the book so much better. They really should, Julie. I think there is something to be taken away from Wonder for everyone.